are the perfect opportunity to create a focal point. Not only does a fireplace make a house feel cozy and warm, but Fireplacemantels and surrounds will add a beautiful and important design statement. 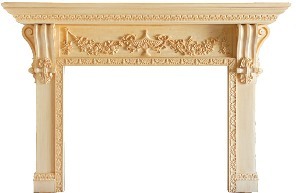 The fireplace mantel can completely change the entire look of your room. A timber mantel will give your room a rustic feel. An ornate marble mantle can accent a Victorian design. You design choices are almost unlimited. It is a decision that requires a lot of thought, sketching, and mulling on. Wood Burning. Masonry fireplaces require a chimney to vent smoke out of the house and are usually custom built of stone or brick. Gas burning. 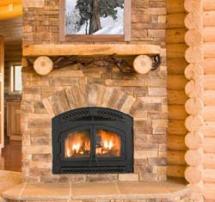 These fireplaces burn natural gas or propane and are either vented or vent-free. Gas fireplaces use ceramic logs that simulate the look of a burning wood and are turned on and off with a switch. 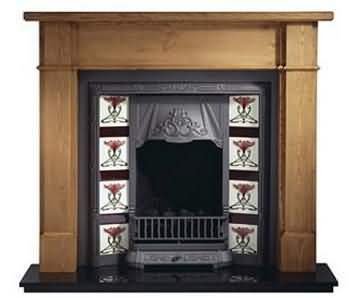 •	Gas inserts can be installed into an existing wood burning fireplace. •	Direct vent fireplaces are vented out of an exterior wall so there is no need for a chimney. •	Vent-free gas fireplaces require no chimney. They are stand alone heaters and can be installed anywhere in a house. Electric fireplaces. Relatively inexpensive and easy to install. They don’t require a chimney or any venting — simply plug them into an electrical outlet. Some produce heat and blowers while others are ambience only. Outdoor fire pits. Having grown in popularity as home owners have developed their yards for exterior entertainment outdoor fireplace can be as simple as a hole in the ground or an elaborate outdoor kitchen. Landscaping, furniture, and a patio surface can transform an outdoor area into an extra room. It’s possible to change the look of a fireplace dramatically. If you don't like the red brick facing on a traditional masonry fireplace, it can be transformed with a surround. Surrounds can be all wood, stone, tile, precaste and iron. They can be a combination of almost any of these materials. A mantelpiece can be changed relatively easily also. 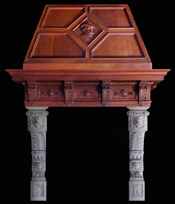 Mantels can be simple, ornate, and unique. A new mantelpiece, or moldings can compliment the architecture and interior design features of your home. 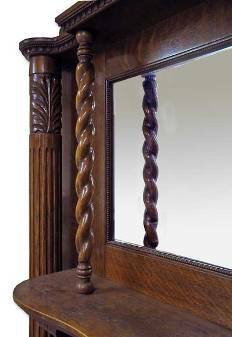 Consider a double or overmantel with mirror(s)in the upper section and corbel lifts carrying a display center. Add carvings! It only ends with your imagination. Choices may include fireplace mantels decorated with urns and flutes, with rosettes, or with stylized scrolls of leaves and flowers. There has been a development of plasma tv's installed above mantels. A resonably skilled and dedicated woodworker can build their own. 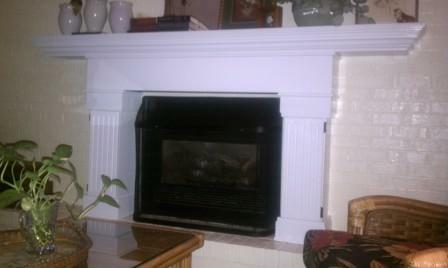 The following mantel was custom sized for a gas insert. Note the fluted columns- They are really hinged doors allowing storage space.